Lake Arrowhead&apos;s 9,215 acres are located within the San Bernardino National Forest, 20 miles north of the city of San Bernardino. 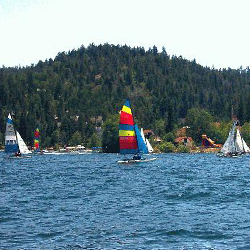 Lake Arrowhead lies 90 miles east of Los Angeles and 72 miles west of Palm Springs. Surrounding communities include Blue Jay, Twin Peaks, Cedar Glen, Rimforest and Sky Forest. Ontario International Airport is a one-hour drive from the lake. 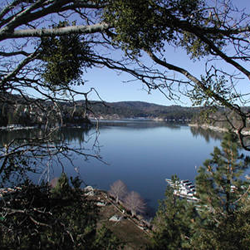 Lake Arrowhead residents enjoy 14 miles of shoreline on 784 acres of private lake. 319 days of sunshine, mild winters and only 40 inches of rainfall on average makes Lake Arrowhead an excellent place to live an active outdoor life while still experiencing a four season atmosphere. Winter activities include skiing and snowboarding at one of three nearby snow parks or ice skating at the Ice Castle International Training Center. Water skiing, hiking and mountain biking trails and off highway vehicle areas are available for spring and summer adventures. Lake Arrowhead also has a private golf and country club. 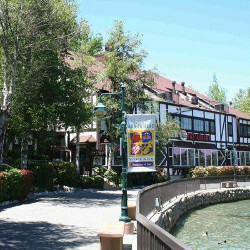 Lake Arrowhead Village is nestled in the beauty of the woods, having the charm of Swiss chalets, while offering a variety of modern amenities. The Village houses an assortment of quaint specialty shops, as well as outlet stores, dining and entertainment including free concerts and events. Join the fun and visit Lake Arrowhead Village to experience live performers at the free outdoor Summer Concert Series featuring a Beer Garden and dynamic bands. It&apos;s also a great place to celebrate the holiday&apos;s with activities such as the Village Easter Egg Hunt, the annual 4th of July Fireworks, Oktoberfest, Halloween Trick-or-Treating, and Santa&apos;s Tree Lighting Ceremony. More seasonal festive events include the summer Farmer&apos;s Market, Antique & Classic Wooden Boat Show, Cruisin&apos; the Village Classic Car Show, Kid&apos;s Activities Day, and the Annual Fireman&apos;s Bonfire. Mountains Community Hospital is Lake Arrowhead&apos;s 24 hour, full service hospital. Lake Arrowhead has it&apos;s own fire department, California Highway Patrol Office and is patroled by the Sheriff&apos;s Department located in Twin Peaks. Schools in Lake Arrowhead are K thru 12 and are a part of the Rim of the World Unified School District. Six schools in the district have be named California Distinguished Schools. The Mountain News is the local newspaper and it serves Lake Arrowhead and it&apos;s surrounding communities. Only owners of residential real property in Arrowhead Woods, except Lakewood tracts A & B, shall be eligible to become a member of the ALA and enjoy all that Lake Arrowhead offers.